Ocean International Works dealing on manufacturing and exporting different types of Mini BOPP Tape Slitting Rewinding Machine also known as Baby Slitter Machine from India. A genuine specialized supplier ofMini Slitting Rewinding Machine. We manufactures, exports & supplies of Mini BOPP Tape Slitting Rewinding Machine with high quality to meet client’s requirement. Our machines are designed with wide range of quality for long lasting heavy duty process, specially for Slitting/Cutting in different sizes from 12 mm. Ocean International Works dealing on manufacturing and exporting different types of Mini Slitting Machine also known as Baby Slitter Machine from India. A genuine specialized supplier of Mini BOPP Tape Slitting Rewinding Machine. We manufactures, exports & supplies of Mini BOPP Tape Slitting Rewinding Machine with high quality to meet client’s requirement. Our machines are designed with wide range of quality for long lasting heavy duty process, specially for Slitting/Cutting in different sizes from 12 mm. Ocean International Works dealing on manufacturing and exporting different types of Mini Slitting Rewinding Line also known as Baby Slitter Machine from India. A genuine specialized supplier of Mini BOPP Tape Slitting Rewinding Machine. We manufactures, exports & supplies of Mini BOPP Tape Slitting Rewinding Machine with high quality to meet client’s requirement. Our machines are designed with wide range of quality for long lasting heavy duty process, specially for Slitting/Cutting in different sizes from 12 mm. Ocean International Works dealing on manufacturing and exporting different types of Mini Bop Tape Slitting Plant also known as Baby Slitter Machine from India. A genuine specialized supplier of Mini BOPP Tape Slitting Rewinding Machine. We manufactures, exports & supplies of Mini BOPP Tape Slitting Rewinding Machine with high quality to meet client’s requirement. Our machines are designed with wide range of quality for long lasting heavy duty process, specially for Slitting/Cutting in different sizes from 12 mm. Ocean International Works dealing on manufacturing and exporting different types of Mini Bopp Tape Slitting Machine also known as Baby Slitter Machine from India. A genuine specialized supplier of Mini Bopp Tape Slitting Machine. 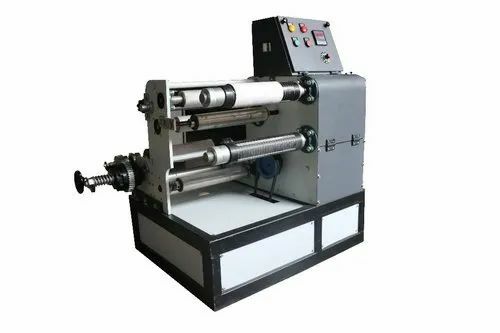 We manufactures, exports & supplies of Mini BOPP Tape Slitting Rewinding Machine with high quality to meet client’s requirement. Our machines are designed with wide range of quality for long lasting heavy duty process, specially for Slitting/Cutting in different sizes from 12 mm. Ocean International Works dealing on manufacturing and exporting different types of Slitting Rewinding Machine in India also known as Baby Slitter Machine from India. A genuine specialized supplier of Mini BOPP Tape Slitting Rewinding Machine. We manufactures, exports & supplies of Mini BOPP Tape Slitting Rewinding Machine with high quality to meet client’s requirement. Our machines are designed with wide range of quality for long lasting heavy duty process, specially for Slitting/Cutting in different sizes from 12 mm. Ocean International Works dealing on manufacturing and exporting different types of Mini BOPP Tape Slitting Rewinding Machine also known as Baby Slitter Machine from India. A genuine specialized supplier of Mini BOPP Tape Slitting Rewinding Machine. We manufactures, exports & supplies of Mini BOPP Tape Slitting Rewinding Machine with high quality to meet client’s requirement. Our machines are designed with wide range of quality for long lasting heavy duty process, specially for Slitting/Cutting in different sizes from 12 mm. Ocean International Works dealing on manufacturing and exporting different types of Mini Slitting Plant also known as Baby Slitter Machine from India. A genuine specialized supplier of Mini BOPP Tape Slitting Rewinding Machine. We manufactures, exports & supplies of Mini BOPP Tape Slitting Rewinding Machine with high quality to meet client’s requirement. Our machines are designed with wide range of quality for long lasting heavy duty process, specially for Slitting/Cutting in different sizes from 12 mm. Ocean International Works dealing on manufacturing and exporting different types of Slitting Rewinding Line also known as Baby Slitter Machine from India. A genuine specialized supplier of Mini BOPP Tape Slitting Rewinding Machine. We manufactures, exports & supplies of Mini BOPP Tape Slitting Rewinding Machine with high quality to meet client’s requirement. Our machines are designed with wide range of quality for long lasting heavy duty process, specially for Slitting/Cutting in different sizes from 12 mm. Ocean International Works dealing on manufacturing and exporting different types of Slitting Rewinding Machine also known as Baby Slitter Machine from India. A genuine specialized supplier of Mini BOPP Tape Slitting Rewinding Machine. We manufactures, exports & supplies of Mini BOPP Tape Slitting Rewinding Machine with high quality to meet client’s requirement. Our machines are designed with wide range of quality for long lasting heavy duty process, specially for Slitting/Cutting in different sizes from 12 mm. Ocean International Works dealing on manufacturing and exporting different types of Slitting Rewinding Plant also known as Baby Slitter Machine from India. A genuine specialized supplier of Mini BOPP Tape Slitting Rewinding Machine. We manufactures, exports & supplies of Mini BOPP Tape Slitting Rewinding Machine with high quality to meet client’s requirement. Our machines are designed with wide range of quality for long lasting heavy duty process, specially for Slitting/Cutting in different sizes from 12 mm. 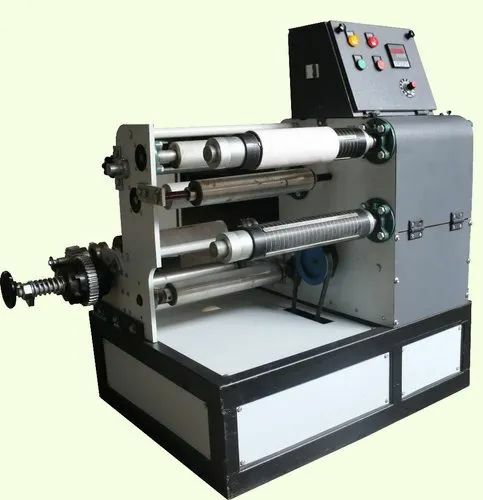 Looking for “Mini Slitting Rewinding Machine”?